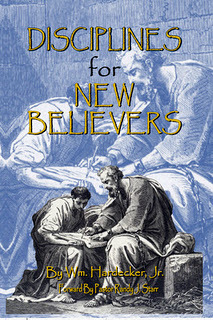 Disciplines for New Believers (Kindle edition) has been a part of Amazon's KDP Select program (of which my kdp select program is set to expire on March 09), which enables Amazon Prime Members to download the book for free, and allows for Kindle readers to borrow it free with no due date (as part of their lending library). DfNB Kindle edition can still be purchased like usual for $4.00, but starting tomorrow it will be FREE for the next five days. Also, along with that development, Starr Publications is offering the actual book format of DfNB at a bulk special (10 for $45.00). You can click on the Starr Publications link here, and click on the "Specials" tab (located on the left) and there it is called "Bundle #1." What exactly is my book about? It is an eight week discipleship booklet designed for new converts to train them in daily thinking about rudimentary Scriptural principles and relevant topics at the same time introducing them to basic Baptist doctrines, and basic Bible study tools.